If you're visiting from Alma's tour at Almafied, welcome! for all you first-timers here, I want to thank you for touring my living room. 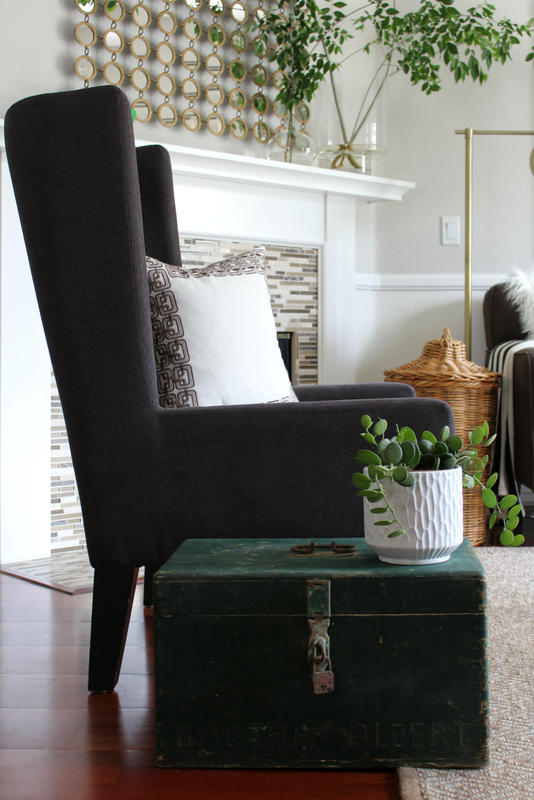 I was asked by my friend Kathleen from Lindsay Hill Interiors to participate in a blogger "One-Room Spring Tour" where 25 bloggers freshen up one room in their house for spring to share on their blog. I was like, "YES PLEASE!" 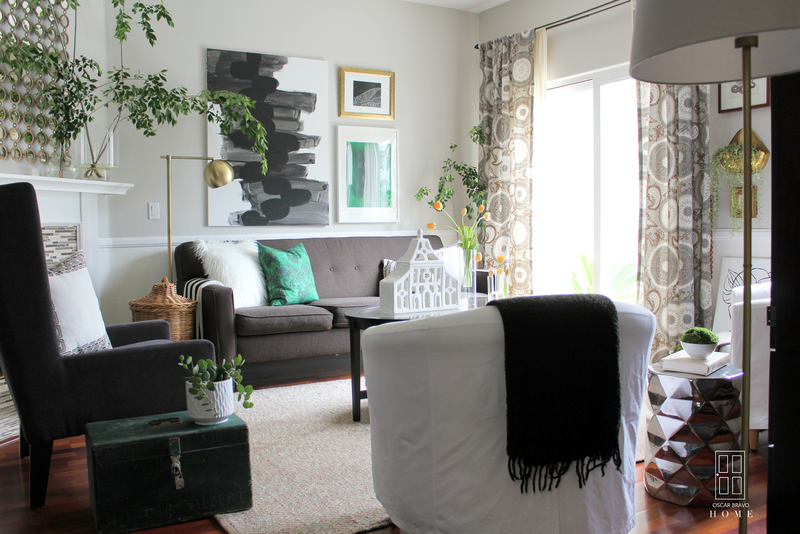 I've been wanting to refresh my living room anyway so this was perfect timing! There's 25 of us all together and each day this week, 5 bloggers share 1 room on their blog and link each other up. You can tour the rooms and see different styles and get some great ideas for you to incorporate in your home. SO PIN AWAY, MY FRIENDS! PIN AWAY! I will have the complete list of tours at the end of this post. First, I want to show you a before picture of my living room. 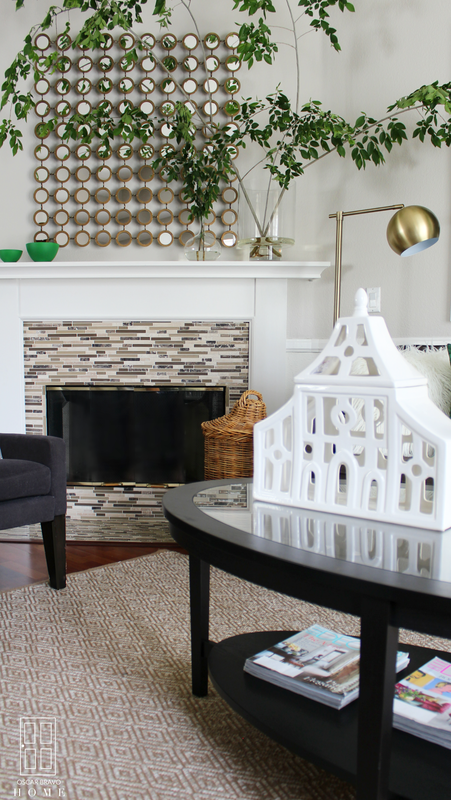 I am really excited how much my living room has changed for spring by just switching up the accessories. I mean, I liked the "before" but the space felt a bit lackluster, you know? 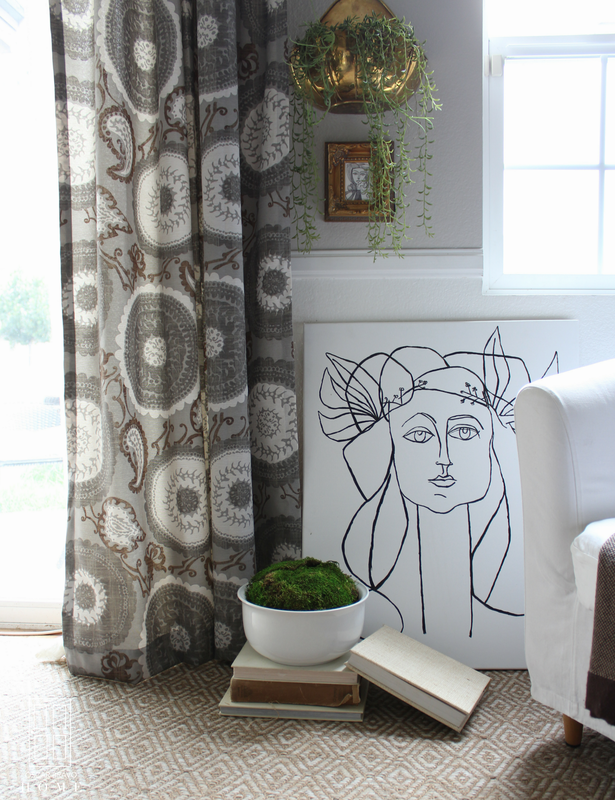 I wanted a pop of freshness in my home! I kept all the furniture the same, with the exception of my lamp that I brought down from my bedroom. I think switching the art makes the biggest difference! I love my new gallery wall! And, I painted all of my pieces on my own! It's a hard combination, yo! I would love to be able to spend freely on my home, but it ain't happening! #firstworldproblems. This means that I look for deals, buy flexible items, and "try" to DIY! I encourage you all to create your own art pieces, it's fun! Get some inspiration from your favorite artists, get a canvas, some paint and a paintbrush and let the Picasso in you come out! My painting didn't stop there. I decided that I wanted green pottery. So I grabbed some green spray chalk paint (available at your craft store) and sprayed a couple of bowls! Cereal bowls never looked so chic! I added my new green "pottery" to my mantel, along with some huge tree branches from my parents' yard. For impact, I went BIG with the branches. 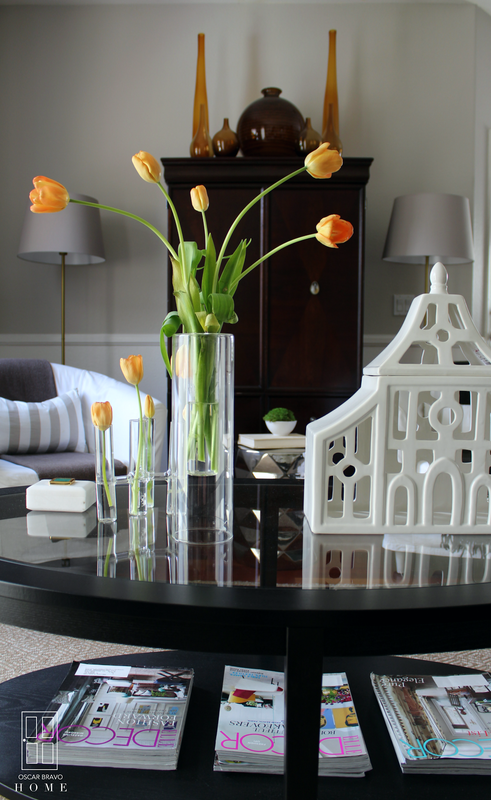 Finished the room with some tulips. 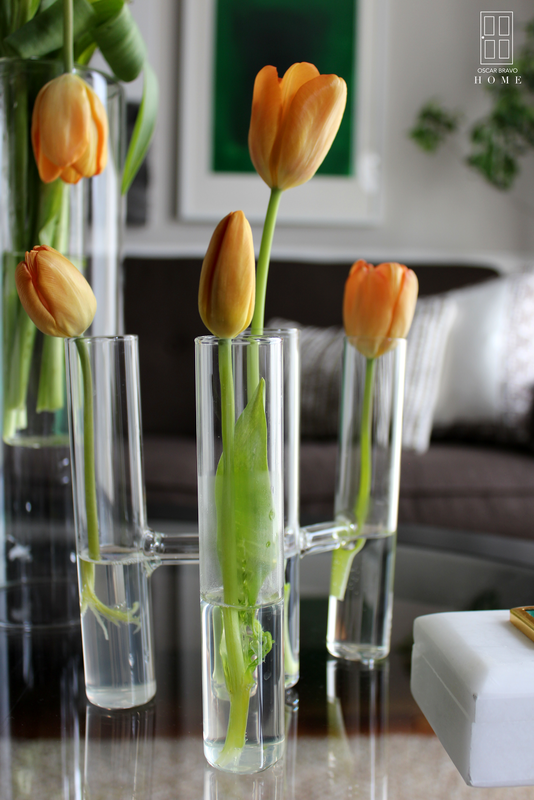 Fresh flowers always bring good energy to a space. Let's see how long my living room lasts this way! Thanks again for hanging out! I hope you had a good time! 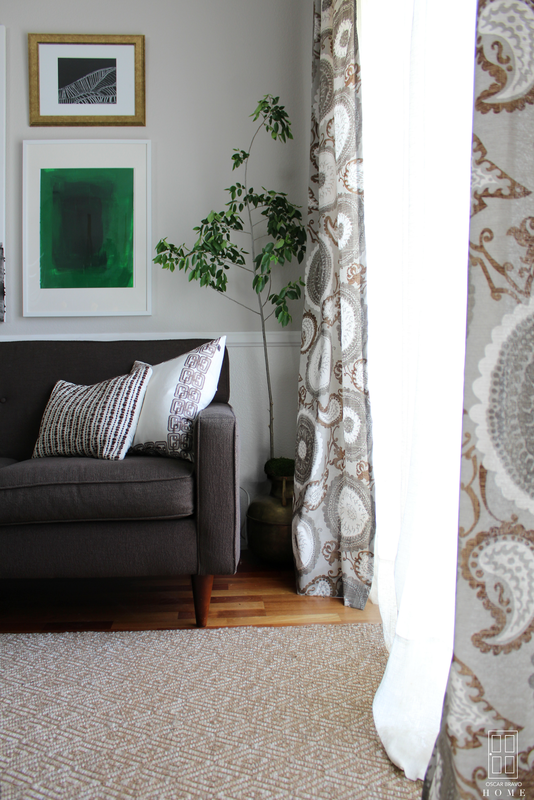 I know that I had a great time revamping my living area for this One-Room Spring Tour! Please don't forget to subscribe to my blog posts by adding your email to my subscribe box at the bottom of my blog! I would love you for it! 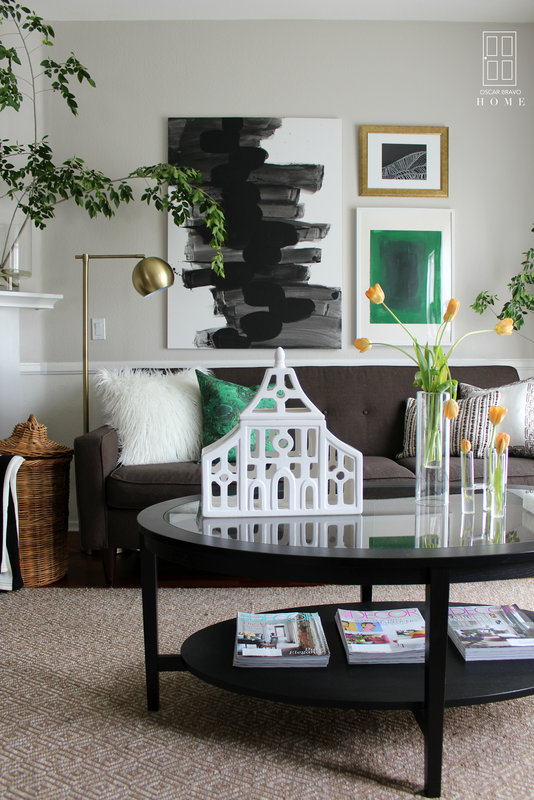 Go see how Ashley freshened up her living room for this One-Room Spring Tour! You are going to fall in love with her beautiful home and her amazing photography skills! 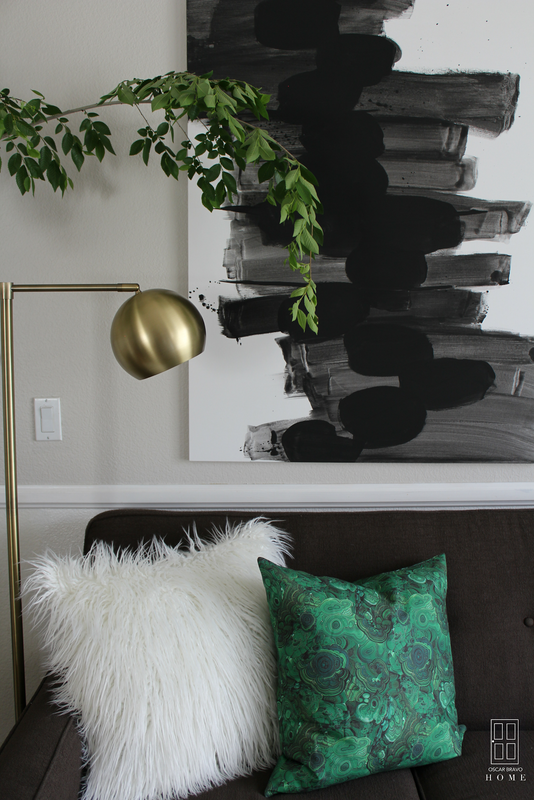 Oscar, the green, the art, the brass lamp- you have creatively styled this room to perfection! Wow!!! I love the after! The green makes it all so fresh and the black and white is stunning. Gorgeous!! Aw thanks Emily! I appreciate you stopping by! Gorgeous! The artwork is beautiful. Love the green and the pretty tulips too. Oscar this room is so fun and perfectly styled! Loving the green in here! Oscar!! I'm dying. It's so beautiful and beyond creative!! I want to immediately start spray painting cereal bowls. Ha! Seriously pure genius! I can't believe you DIY'ed that art my friend - want to come for a quick trip out to Connecticut and hook me up for some art for my master bedroom?? It made a huge difference in your space - beautiful! Lol Kris, it would be an honor!!! Thank you, my friend! Gorgeous, gorgeous! Love how creative you are with your art! The pops of green are the perfect refresh too! Thank you very much, Stacey! I appreciate you checking it out! Oh.Em.Geeeee!!! Oscar, the art is my fave and I LOVE that you did it yourself! Seriously, I thought they were prints from Minted. So, so good. 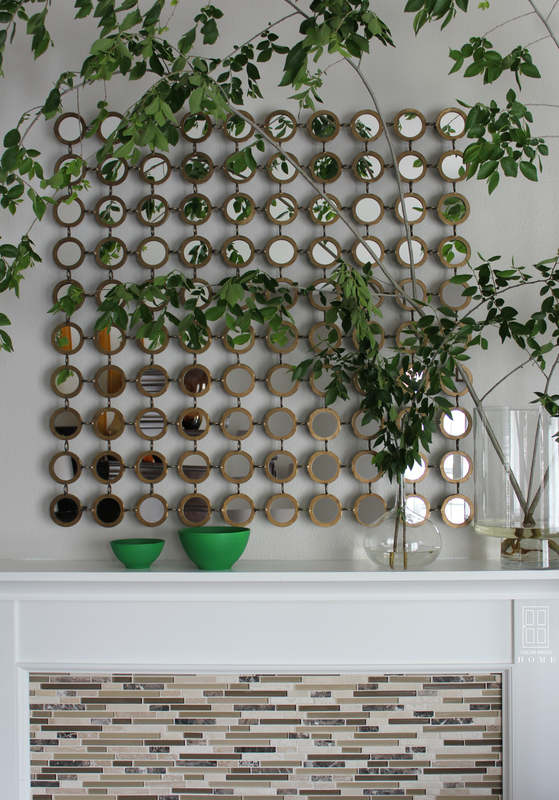 Love the touches of green! And the oversized branches! Kudos! It's a beautiful refresh Oscar! Love it all!! Oscar this tour was beautiful!!! I loved all the green!! I love that you did the art also, looks amazing!!! love! the green! the tulips! the art!